1. This product is water-based, to maintain effectiveness, please clean up before spray, when use outside, avoid raining weathers. 2. to maintain effectiveness, it is better to do a small spray 3 days after the first spray, if there be no water wash away, it could last for a least 2 weeks long. 3. 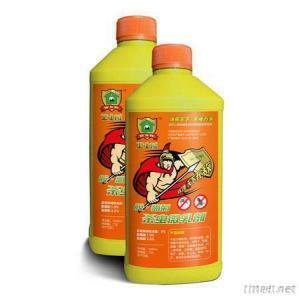 This insecticide would degrade in exposure of sunlight or in alkaline materials, to maintain effectiveness, it is better to use it late in the afternoon or cloudy days. Do not store after Dilute. 4. Depend on the size of the pests, you can adjust the proportion of water to the insecticide. General speaking, kill “hard-shell” bugs need thicker potion than the “soft-shell” ones. 5. Suitable for different kinds of instruments, for ULV sprayer, directly spray in the ratio of 1:10, for normal sprayer, directly or residual spray in the ratio of 1:30-50. 6. Directly spray to kill insects: in the ratio of 1:100.